Blackjack, a popular casino gaming entertainment, is surrounded by myths pertaining to winning strategies that can beat the house to let you win almost every time. The reality in fact and what keeps blackjack high on the challenge it carries, is that all proposed strategies are based on mathematical calculations which rely heavily on probability and chance. Chance and probability is simply just that and by default carries the chance and probability of not winning too! Nothing is 100 per cent predictable, otherwise, there would be no fun playing the game. The blackjack basic strategy, first developed by Edward O Thorp, dating back to the early sixties, was one of the first attempts to unlock the secrets to winning big. It is still famous and does give the player some control over the various possible moves, bringing him closer to beating the house more often but it is not a clichÃ© for winning and the player must use a combination of strategies and techniques to win, or, at times, to lose less of his precious money. The card game involves interplay of numbers. The player makes calculated moves based on his point total against the dealer's visible card, always trying to keep an advantage to winning big. An ace with a card valued 10 in the first round of two cards is called a blackjack and can beat any hand other than a blackjack itself in which case it becomes a push. The basic strategy is dependent on the number of card decks used and the casino rules. It is best to understand how it works and then to use it according to the demand of the situation making the various possible moves at the right time. The basic strategy chart displayed here is for a 6 to 8 deck game and keeping in view the Las Vegas Strip rules. 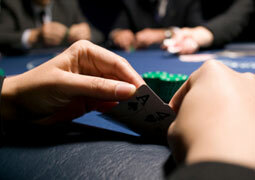 Card Counting, another winning strategy, is based on the make-up of the deck of cards, un-dealt and on display. The objective is to keep track of the ratio of high to low cards in the deck and bet higher when the deck is calculated to contain more of high cards and less if it contains more of low cards. The various player moves are also guided by the card count strategy. With more of ten-count cards in the deck, the chances of getting a blackjack and hence more money are higher. Repeated reshuffling of the deck makes the player lose track of the counting which provides the house an edge over the game a reason for which the basic strategy is a better option especially in online games.